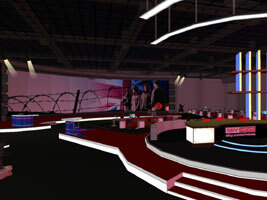 Yesterday saw the opening of yet another media corp to Second Life, this time it's Sky News. And like Channel 4 it is a Rivers Run Red production, so I was wondering what they'd come up with this time, since the Channel 4 release earned heavy criticism in the blogger community. Many people I've talked to say a Real Life company should go for a daring, innovative design in a virtual environment and not stick to a RL representation. In this case, they're absolutely wrong. 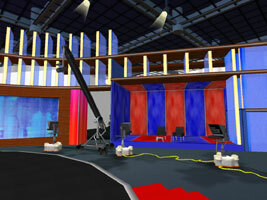 The Sky News sim is rather RL-like, but works a lot better than the C4 sim I just can't relate to. 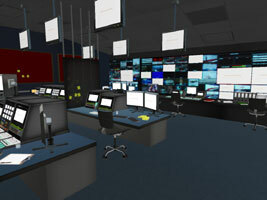 "The main aspect of the venue is the virtual Sky News Centre, complete with an audio feed from the RL centre as well as streaming video of Sky News show on the plethora of screens and monitors. Part of the roadmap for this venue is the re-creation of news events and stories and this will be the sweetspot for enabling residents to engage and interact with the news - this is what metaverse marketing applications is all about : Engagement. 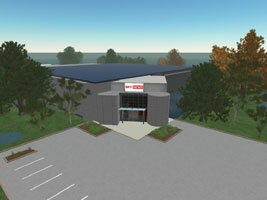 Another key success factor for metaverse marketing is integration and there’s lots of it here." 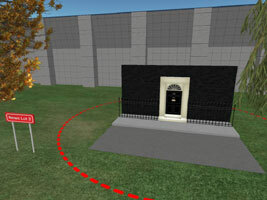 The opening of the sim coincides with the Guardian Hay Festival, which explains the extra setup at the back of the main building (picture left). A last nice feat of the sim is a number of fake decorums, like the entrance of 10 Downingstreet (picture right) which leaves you wondering how they do it in RL, especially if you've seen the Wag the Dog movie.